A king may move a man, a father may claim a son, but remember that even when those who move you may be kings or men of power, your soul is in your keeping alone. When you stand before God you cannot say “but I was told by others to do this or that;….” This will not suffice…. What a great quote — especially for a movie. And it makes a great point about how we live out our faith in God. God cares about our hearts, not the hearts of people we listen to. It is a good thing to seek the wisdom of others, but listening to others does not replace our individual obligation to live out life as God wants us to live. As much as I hate the cliche nature of the phrase, What Would Jesus Do? It is the right question. It matters not what Joe would do, or Susan, or Bob, or Harry. Jesus is the model. And what he did was to love as no one on earth had ever loved before. He gave himself to you and me, for our good, expecting and requiring nothing in return. We may choose to follow his example, or we may choose to ignore his example. It’s your choice and it’s my choice. And even it we try, we’ll never completely live up to that standard. There once again, Jesus’ love kicks in, and by his grace, we’re forgiven of our failures and by his grace, we get credit for trying — in spite of our failures. Are you listening to Jesus or to the wisdom of men? As you can see from the photo, I have a special gift. It hasn’t been the thorn in the flesh, that Paul complained about in his epistles, but it certainly has kept my attention and the attention of others as well. This time of year, I keep a red stocking cap in my car, because I never know when I might need to become Santa. This year, I was able to be Santa for the children of some US airmen, deployed from Andrews AFB. Digital pictures were printed “on the spot” and mailed to mothers and fathers in Iraq, Afghanistan and other places. I rode around South Arlington, Virginia, on a fire engine from Arlington Co Fire Department, Station 5. We brought out kids, parents and grandparents from houses all over and put smiles on a lot of faces. It feels great when you can wave to someone, yell “Merry Christmas” and they smile and wave back. We stopped at an ice skating rink and a bunch of folks took pictures with Santa. We stepped inside a bar, where Santa had his picture taken with a young woman about to move to Germany. My favorite thing is to put on the suit and ride my motorcycle around Springfield Mall and other nearby shopping centers. Smiles, honks, waves — it makes me smile. Christmas morning, I visited the post-partum floors of Inova Fairfax Hospital. A lot more photos with new moms and new babies. I got to hold a lot of new babies that morning. Someone on the nursing staff said thanks for coming by, but I got more out of it than the folks I visited. 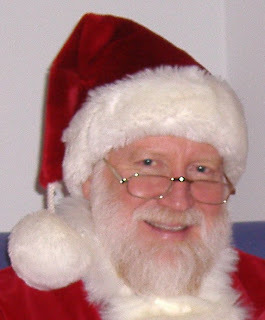 When you look like I do (white beard and all) and you put on the suit, you always have to be ready to respond to the look of a child, or even the appreciation of an adult. But, then again, when you’re a follower of Jesus, a follower of the command to love one another, then you always have to be prepared to give yourself to others, for their good, expecting nothing in return — just as Jesus did for us. This will sound somewhat heretical to some — less so to others — but, I think a lot of folks have missed an important point in their reading of the New Testament. Jesus’ focus doesn’t seem to be as much as creating an organization, as it is on changing the basis of living life. However, if you look at the way Christianity manifests itself today, you pretty much have to conclude that we’re more interested in the organization. Jesus seemed to debunk organization all the time. He regularly chastised the Jews for missing the point of the Law. Look at the Parable of the Good Samaritan. The Priest and Levite both “passed by on the other side of the road,” because if they stopped to help this poor guy, they might become unclean and be unable to perform their priestly duties until they were purified. Isn’t that something — they created rules that made it wrong to stop to help someone who needed their help. Contrast that with Jesus’ view, who taught to give yourself to others, even when it’s inconvenient for yourself. Christians get together because of their need for encouragement and support from other Christians. Living as a Christian is hard and difficult. We need each other. But the goal of getting together is not to build an organization, the goal is to help each other. The organization does not provide the path to God, it’s just an association of everyone who has already found the path and are just trying to keep going. I have a friend, Bill Clark, who, for many years, lived in Israel, while he translated the New Testament from the original Greek into Aramaic, so that Palestinians could have a translation in their own language. An ancilary project was a new English translation, which he doubted, The Galilee Translation Project (GTP). If you’re interested you can get a copy of the translation at no cost, by following this link. What sets this translation apart from others is Bill’s translation of the word, agape, one of several Greek words typically translated into English as love. Bill makes a strong case that love is a poor translation of agape, because the English word has so many different levels of meaning and because its common usage often allows readers to misunderstand what the New Testament writers were trying to convey. I’m not going to elaborate on that for now, because such elaboration is really a major part of why I’m starting this blog.